Best Blocks for Chevy Heads Reviews: Top-5 in April 2019! The Chevrolet small-block engine was first introduced in 1955 and lasted till 2003. This amazing series of V8 automobile engines lasted half a century due to its simple yet efficient design using the materials and resources available at the time. Small block engines come in a number of configurations, starting from 262 cu in (4.3 L) and going up to 400 cu in (6.6 L) in displacement. The most popular small block as the 350, followed by the 305. The small name block comes from comparing the engine block size to the Chevrolet big block engine series. This was the buzz phrase in the 1980’s, and yes, some of us were old enough to say it and do it too. Essentially, by the mid 80’s the 350 was filling up junkyards by the thousands, and youngsters are seeking ways to soup up their Malibu’s, and Monte-Carlos got this crazy notion that s 350 small blocks Chevy engine would do the job. Well, it did do the job for many. The 350 basically lasted well into 2002 but appeared as a truck engine, and its final days saw it used as GM’s full-sized vans engine block. The last model to come out was the Vortec 5700 which is known as the L31 variant. So many were made that you can still buy an original uncrated one from any number of distributors. Apart from the classic 350, there was a 349.5 version, this came out in 1992, and it was called the LT1 variant, it sported the same 4″ bore as the classic 350, but it was actually a totally different engine. This variant didn’t outlast the original 350, and it was discontinued in 1996. I can ramble on more about the small block, but let’s concentrate on the heads. When considering a head to buy, you can break the bank with overspending for something you don’t really need. The best option for a budget head is a factory casting. However, you need to maintain the integrity of the combustion characteristics, the flow potential and the chamber volume must be small enough to get a working compression ratio without an abnormally high, plug-masking, piston crown. For those seeking a lower budget option, always go for cast iron, the material is cheaper than the more expensive aluminum heads. It’s best not to take open chamber heads, even if it hurts the pocket. Always prefer closed chamber heads as the alternative for the budget-friendly cast iron models. If you can afford them, and also seek a performance upgrade then go for aluminum heads that deliver extra options for upgrading power and torque. Aluminum heads do last longer than iron and are less prone to crack. In this article, I present the best small block Chevy heads for the 350-type engine. This is a fully assembled racing performance head with every possible detail crafted into place to deliver extreme performance. The 102-5050 model comes with 2.02″/1.60″ stainless swirl polished valves and 62cc exhaust runners. There are Hi performance springs (.550″ lift hydraulic flat tappet) with Positive seals, and 3/8″ screw in stud with hardened steel guide plates. The locks are hardened and come with retainers, and the intake guides are manganese bronze. The exhaust guides are made from phosphor bronze, and there are 180cc Intake Runners with 64cc Combustion Chambers. The single valve springs with flat wire inner damper have a seat pressure of 130 lbs. The springs are compatible with mechanical flat tappet or hydraulic flat tappet cams that deliver up to .550 lift. Pre-1986 design small block Chevy cylinder head with a standard exhaust port design. If you are seeking that extra edge but want to retain the original design, then this is the model you would want in your Chevy. It delivers extreme performance conditions. 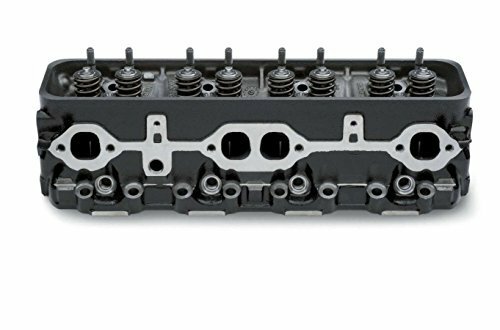 This is the Chevrolet Performance 12558060Vortec Cylinder Head for stock replacement. This model is an OEM replacement made of the same materials as the original headers. It’s a cast iron construction that requires Vortec-specific intake manifolds. 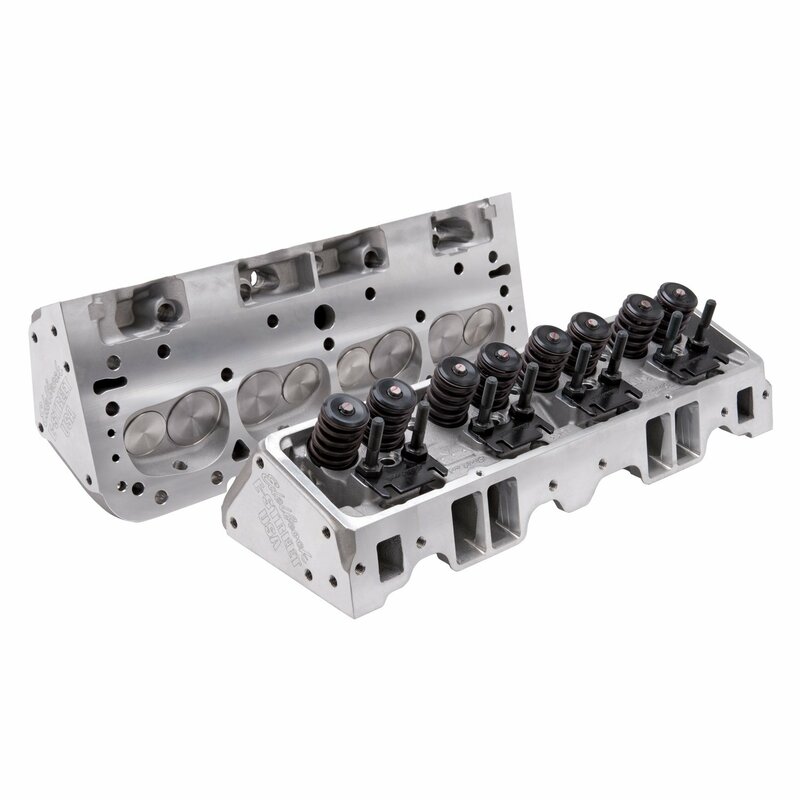 The Cast Iron Vortec Cylinder Head comes completely assembled with 1.940/1.500 valves. This model comes with the bare head 12529093, a 64cc combustion chamber and works with Straight spark plugs. There are no heat risers, and you need Camshafts with more than 0.475 lift. You can machine this header for 2.020/1.600 valves, and the valve spring seat diameter is 1.280. You can also drill or pin the rocker arm studs to 3/8”. This model has intake and exhaust valves that complement the high-velocity port design for your performance demands. This cast-iron model immediately provides a 20 to 40 horsepower improvement over the older block you are replacing, even without tweaking it for performance. This cast iron header is reminiscent of an age gone by, and it performs as it was intended to, with even better expectations. 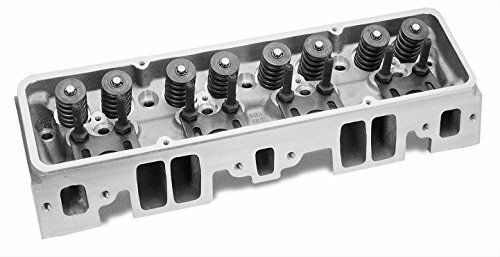 This is the Dart Special High-Performance Cylinder head for 1969-1974 Chevy Corvette 5.7L With Chevy Small Block Gen I Engine Stud. You cant more specific than the description; this header is designed to fit on all 1969-1974 1974 Chevy Corvette 5.7L with the Chevy Small Block Gen I Engine Stud. As such, this is a performance upgrade designed to deliver even more power and control after installation. This is a street, strip, and oval track upgrade providing maximum torque and throttle response from idle to 6,000 RPM, and it is compatible with most standard components on the market. Dart’s Special High Performance (SHP) cylinder heads are 23° 180cc made from cast Aluminum for weight reduction leading to even better performance. The precision cast ports are engineered to offer flow and power, and you don’t need to perform a CNC porting. The optimized chambers improve combustion efficiency, and the multi-angle intake seats and radiused exhaust seats increase this output dramatically. Some seekers of speed and performance will demand more from their aftermarket upgrades; this is one of those “more” products and its focus to a very specific group of applications. 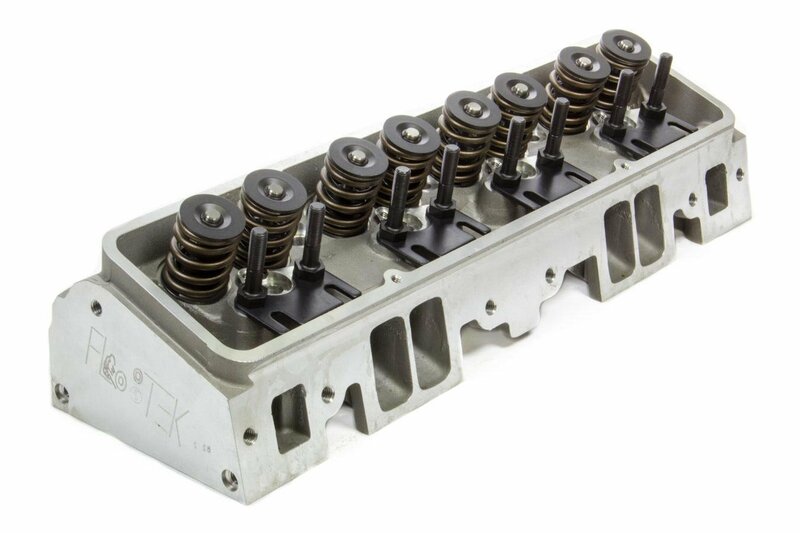 This is the Edelbrock® E-Street™ Complete Satin Cylinder Head kit that comes as-cast ports and is built for entry-level street performance applications operating in the idle-to-5500 rpm range. 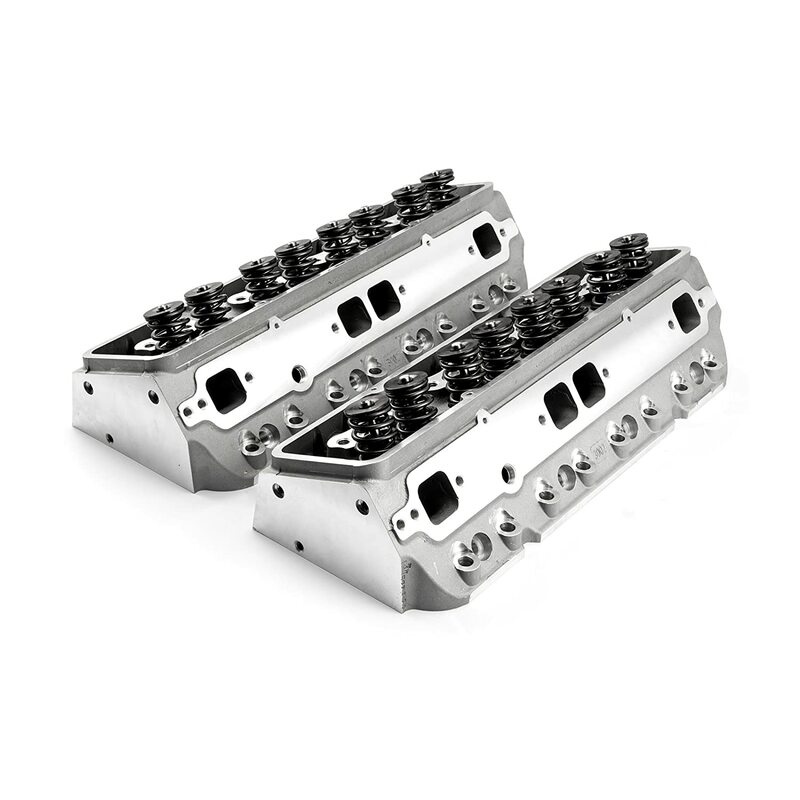 The Edelbrock® E-Street™ Complete Satin Cylinder Head Set delivers a combustion chamber design that optimizes the combustion process with a larger than the stock intake. The exhaust ports efficiently flow more air through your engine, together, the combined upgrade features deliver a highly successful, powerful and serious performance upgrade for your 1955-1986 applications. On closer inspection what you find is an as-cast port system designed for entry-level street performance for use with hydraulic flat tappet camshafts only. This model is not compatible with hydraulic roller camshafts. These are all dyno tested and showed gains of 16 hp and 11 ft-lbs of torque over the competition. This model comes with a choice of 70cc or 64 cc combustion chamber the intake runner volume is 185cc, and the exhaust runner provides 60cc of volume. The intake and exhaust valve diameters are standard, 2.02”/1.60” and there is an 11/32” diameter valve stem. To assure continuous performance, the valve guides are made from manganese bronze. The deck thickness is 9/16,” and there is a 3/8” rocker guide plate made from hardened steel. The valve angle is 23°, and the pushrod diameter is 5/16” with a stock exhaust port. This is the Speedmaster® PCE281.1471 Full CNC Bare Aluminum Cylinder Head for 2007-2009 applications. The Speedmaster PCE281.1471 is a one-piece cast aluminum body that has a 68cc Combustion with 270cc intake runner. This part is produced using standard gravity casting for precision products using special cast aluminum alloy to reduce porosity and improve thermal coefficiency. This model comes with a full set of individual O-rings around each port that is designed to seal the Intake manifold to cylinder head. The Head Gaskets use 100% stainless steel and these aid in sealing, where both outer layer Gaskets are treated with a high-temperature coating. This single piece comes with a CNC-Machined oval intake and oval exhaust runner. The 15° intake valve diameter is 2.165,” and the 15° exhaust valve diameter is 1.59”. There are bronze valve guides and a 3-angle machined valve seat made from ductile iron. This is a classic OEM replacement for your 2007-2009 350 small block Chevy applications. Air Filters for 6.7 Cummins – Buyer’s Guide!